Now comes the second generation of that display, the P60W26P, and one significant improvement is immediately evident even before you plug it in: the price. The P60W26P costs $14,999—a 40% drop in price from the DPD60W, which cost $24,999 just a year ago. What's more, the new model outperforms the older one in several important respects. Like most plasma displays, the P60W26P is a monitor: a widescreen, 16:9 model in a broad silver frame. Without an external tuner, it won't even display conventional television; most people will simply use a VCR as an NTSC tuner. Of course, this model can also display HDTV, for which you need an external DTV tuner. Its resolution is 1280x720, which corresponds to ABC's high-definition broadcasts at 720p. The more common 1080i broadcasts are converted to 720p (that is, 1280x720) by the P60W26P's internal Sage scaler. The older DPD60W was advertised as offering a maximum resolution of 1280x720, but Zenith admitted that it was actually capable of 1366x768. They make no such claim for the P60W26P. For all the power of the statement this plasma will make in your room, it's a rather simple device, as a monitor should be. It has few features and options. There is, of course, aspect-ratio control, though it's minimal: 16:9, 4:3, and Stretch, which simply magnifies and crops an image to fill the screen. Other products offer a wider range of aspect-ratio options. Like every plasma we know of without an outboard control box, the P60W26P lacks an onboard tuner and offers a bare-bones array of inputs: one for each of the normal analog inputs, including component and RGB, which means you can use the monitor as a computer display. It has none of the new digital inputs, such as DVI or FireWire. And with just one component input, you won't be able to hook up both a digital tuner and a DVD player using component connections unless you have an outboard switching box. That's normal for plasmas; they lack the rear real estate to accommodate lots of inputs. Still, some plasmas—notably Pioneer's latest 50-inch model, the PDP-5030HD—offer outboard control boxes that provide a plethora of inputs. But that would have added to the Zenith's price, which has been kept admirably low. If you connect at least two video sources, such as two external tuners, DVD player, etc., the P60W26P offers picture-in-picture and twin picture (two equal-sized images side by side) display options. There's also a freeze-frame function, activated from the remote. There are only two picture-setting memory locations: one for the RGB input and one for all other inputs. That's a shame. 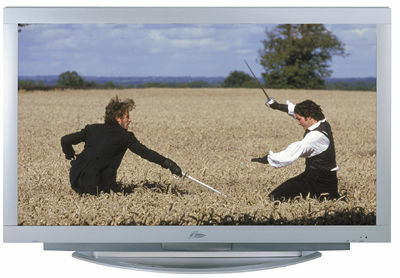 DVDs, VCRs, and, particularly, HDTV usually require different picture settings for each input. Zenith sells optional speakers for the set, designed to connect to either side of the screen by means of friction-clamps. My review sample came without speakers, which was no problem; I assume that almost anyone paying this much for a TV will have a dedicated home-theater audio system. The remote is not backlit, but it is well-designed and easy to use. All of the P60W26P's features are similar if not identical to those on the DPD60W. Where they differed was in performance. The DPD60W was noisy—and I don't mean video noise. It had a loud fan. The new P60W26P was quiet—no fan noise. The older display looked terrible when I first turned it on, with a blue, grainy picture. The P60W26P's picture looked pretty good at first glance. But then, the DPD60W had come with its Contrast control cranked up to 100. The P60W26P's Contrast was set near 50%. It was obvious that my P60W26P had been used before, and adjusted at least to some extent. (Batteries were already loaded in the remote!) In any case, the P60W26P looked pretty good right out of the box. The biggest issue with the DPD60W had been a tendency to temporary screen burn-in, visible primarily from test patterns. If a light-colored pattern was held on the DPD60W's screen longer than average scenes in normal program material, the image was still visible even a minute or two later during dark scenes. It faded away eventually, but that could take several minutes. The P60W26P reduced but did not eliminate this problem. Once, after holding the Color and Tint test pattern from Video Essentials on the screen for a couple of minutes to make adjustments, I saw the words Color and Tint lingering on the screen when, a few minutes later, I looked at a dark test pattern. Within a few minutes, these images faded away. The problem is not likely to affect normal viewing very often because a bright image must be held on the screen for longer-than-normal program scenes before the problem occurs. I didn't notice it while watching movies with the P60W26P. I was delighted with the P60W26P's excellent resolution. Folds and creases in the British and American uniforms in The Patriot were superbly rendered, and frequency-sweep patterns from Video Essentials were especially well-defined, almost down to the last detail. I've seen only a couple of plasmas that could equal or better this performance. Color rendition was impressive; the overall effect was bright, clear, and precise. Like many other plasmas I've seen, the older DPD60W was quite noisy—by which, this time, I mean video noise. This noise was best seen on stable, medium-gray images. The P60W26P reduced the noise but did not eliminate it. Many plasmas, including this one, exhibit an odd quirk: The noise completely disappears from one Contrast setting to the next lower setting. To eliminate the noise on the P60W26P, the Contrast had to be cranked down so far that the picture was too dark. T he plasma technology's greatest weakness is its inability to render black properly, and the P60W26P suffered from this deficiency as well. It could render a convincing black, but it was unable to distinguish between shades of dark gray and black, meaning that detail in dark areas was wholly missing. One test pattern on Video Essentials shows a small bar with three sections in the middle of a white field. The first section is jet black, the second slightly lighter, the third slightly lighter still. On the Zenith, the first two sections of the bar were indistinguishable; I could differentiate the third only by looking very closely. This is not an insubstantial flaw. In dark movies or dark scenes, many areas looked like great, empty voids. This problem is universal among plasmas, but some handle it a bit better—notably Panasonic's wonderful TH-50PHW3 50-inch high-definition model. The P60W26P converts everything to 720p (except, of course, high-definition programming already at that resolution). Numerous artifacts—stair-step patterns, line structure—were visible with NTSC material on the P60W26P. Though it's not mentioned in the literature or Specifications, the P60W26P has 3:2 pulldown correction, which should have cleaned up at least some of these artifacts. But standard-definition, 480i program material is deinterlaced to 480p using Faroudja's DCDi processing, which our prior experience suggests should be pristine. The problems I describe might be traceable to the scaler (from Sage, not Faroudja) that converts 480p to the display's native 720p. I've seen worse scalers, but I've also seen better—and a handful that are much better. Scalers are the greatest weakness of most HDTVs. You can always buy an outboard video processor to use with the P60W26P. Faroudja's excellent NRS is custom-made for this purpose; the company promotes it for use with plasmas. But it seems perverse to spend several thousand dollars on an outboard device to overcome the weaknesses of the scaler built into this product. I had few complaints about the P60W26P when I used it as a high-definition display—HD broadcasts were simply stunning. I watched HBO-HD, HD-Net on DirecTV, and some over-the-air HD on WETA-HD, the local PBS station. All of it was glorious, with startling detail, a rich color palette, and remarkable clarity. This was not the best HD I've ever seen; converting 1080i to 720p necessarily entails a small sacrifice in quality. I was able to check the Zenith's high-definition performance only with 1080i material. Still, the P60W26P's 1080i capabilities were impressive, and I would expect them to be even better with native 720p. There are few 60-inch plasma displays on the market, and none, I think, costs as little as the Zenith P60W26P. For a video monitor of any type, $15,000 is still a lot of money. But the P60W26P is a good product, a clear improvement over its predecessor, and one you're certain to enjoy.